This Queen Creek Handyman is your door repair solution. From your front security door to your back exterior door and every door in between. Sometimes things get a little carried away and the results are an interior door with a fist-size hole in it. I can either repair the embarrassing hole or install a new door. 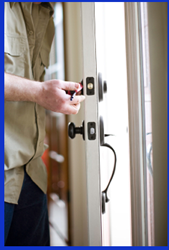 Call this Queen Creek Handyman at (480) 232-7689to repair, improve or replace your problem doors. Queen Creek Handyman Home Door Repairs Include . . . Some of my other Queen Creek Handyman Services include . . .